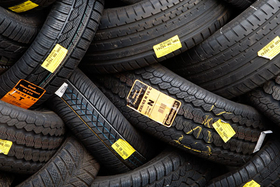 Conti says it has no plans to sell its tire business, which it carved out as a separate unit. FRANKFURT (Reuters) – German auto parts supplier Continental AG held out the prospect of a return to an underlying profit this year, as it battles the effects of the global auto downturn and its own multi-billion euros debt load. A recovery in global automotive production would help boost revenue and potentially even return the company to an operating profit in 2010, including accounting charges and one-off effects from a 1 billion euro loss last year, it said on Tuesday. "Our goal is to be profitable this year on a reported EBIT basis," CEO Elmar Degenhart said, adding later he saw "more opportunities than risks" to beat its targets this year. His upbeat views on earnings sent shares up nearly 7 percent at one point, despite a warning that a host of factors would drain Continental's operating cash and prevent a further reduction of its debt pile this year. "Increasing investments, a further rise in working capital thanks to an upturn in sales and the cash outflows for the restructuring measures initiated in 2009 will significantly limit free cash flow in 2010," Degenhart said. Shares in Continental, the world's third largest auto parts supplier after Robert Bosch and Denso Corp. were up 3.9 percent at 33.81 euros by 11:04 GMT. The company posted an adjusted EBIT of 504 million euro in the fourth quarter and said it had a margin of 8.9 percent. This easily surpassed the average estimate of a profit of 462 million from a Reuters poll. Continental more than doubled its free cash flow to 1.64 billion euros last year but forecast net debt would not fall much in 2010, once it sinks to 7.85 billion euros thanks to a capital increase in January. "They've done a fantastic job last year -- they've generated 1.6 billion in cash and there's only so much you can do in 2010, especially from working capital when production increases," said analyst Arndt Ellinghorst at Credit Suisse. "They give a very very clear guidance on pretty much all the important and major earnings drivers, so I think that's pretty reassuring," Ellinghorst added. Degenhart told reporters Continental would continue to reduce its financial liabilities as it looks to combine with its heavily indebted owner, Schaeffler, to form an exchange-listed company that aims to have an investment-grade debt rating. "Both companies are of the opinion that they can develop technologies better and more quickly together," the Continental CEO and former Schaeffler executive told reporters. The plans do not include paying down debt by breaking up and selling off parts of Continental, which last year completed a carve-out of its tire business. "There are no plans to sell any large company assets, either at the Rubber Group or the Automotive Group," Degenhart said. With 7.45 billion euros in debt due in 2012 excluding an additional revolving credit facility, Continental said it plans to tap the high-yield bond markets with an issue in the first half in order to lengthen its maturity profile. "There is no large necessity to do this in the first half. We can postpone this by several months and still have plenty of time to deal with this before 2012," finance chief Wolfgang Schaefer told reporters. Powertrain continued to suffer losses but Continental pledged the division would break even on an adjusted EBIT basis in 2011. The entire auto supplier industry suffered a nightmare 2009, when carmakers slashed production output at a rate even faster than their corresponding plunge in vehicle sales as inventories were cut back to preserve precious cash. Continental rival Bosch, not only the largest in the industry but also one of the most conservatively financed, suffered an 18 percent drop in revenue at its auto parts business and bled red ink of over 1 billion euros -- its first annual loss since 1945.